A volunteer tells you how the event of the 21 of March 2018 unfolded. “Like every year, the 21 of March – “Day of Memory and Commitment in Memory of the Innocent Victims of the Mafias” is a regular event, where thousands of people from all over the world, Associations and Educational Institutes together with the Libera Association, meet in the main Italian and international squares to celebrate a promise: a conscious commitment that embraces the concept of commemoration, a collective conscience, memory of every time, in the International Day of March 21st. On this day where one tells, where one remembers, where one denounces, one makes memory, truth and justice alive; a significant list of Names of Victims echoes in hearts and consciences. This year alongside those countries involved in the initiative, there was also Malta, determined to take part in this cry, never as now feeling victim but even more warlike warrior, recalling Daphne Caruana Galicia, journalist of inquiry, anti- Maltese corruption and blogger, killed in an attack in October 2017 after denouncing the involvement of government politicians Konrad Mizzi and Keith Schembri in the Panama Papers. The event, which took place at the Great Siege Monument -La Valletta, as a first date was reflected in the sensitivity of the Maltese people, capturing their attention, quantitatively defining a significant audience. The value was further added with the presence of the Caruana Galicia family, who wanted to participate without any intervention, keeping themselves worthy and quietly on the sidelines, attending the reading of the names of the Victims and the further Stories and extracts concerning Daphne. 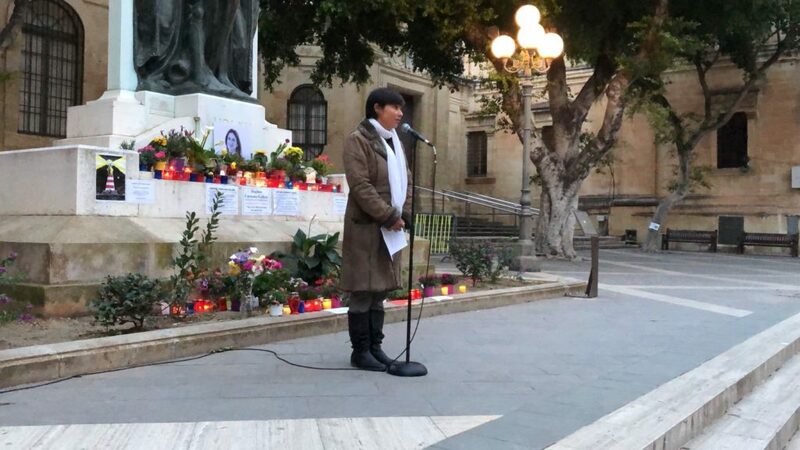 So this day of commemoration was characterized by a heartfelt involvement of Maltese citizens, a significant challenge for the Libera Association that worked in collaboration with the Occupy Justice Association of Malta, along with the intervention of the students of the English School ” Am Language Studio Mt “. This entry was posted in Blog, Corruption and whistleblowing, Europe, Events and tagged Day of Memory and Commitment, journalists, victims. Bookmark the permalink.